What do I do with the leftover pumpkin? There are lots of things you can do! 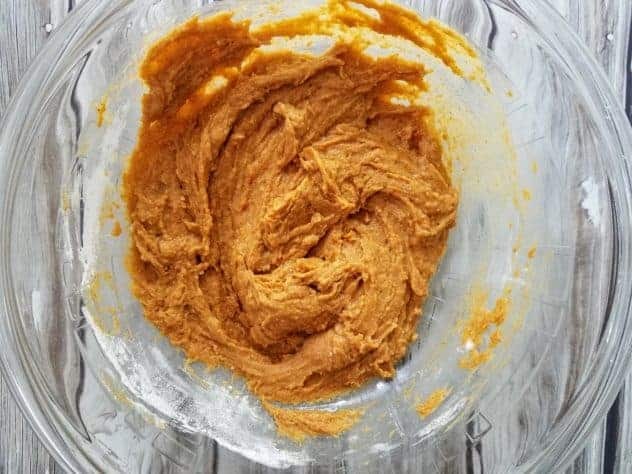 You can use it in other recipes, like pumpkin alfredo, pumpkin nice cream, muffins, cupcakes, etc. Or, you can always freeze it for later use. 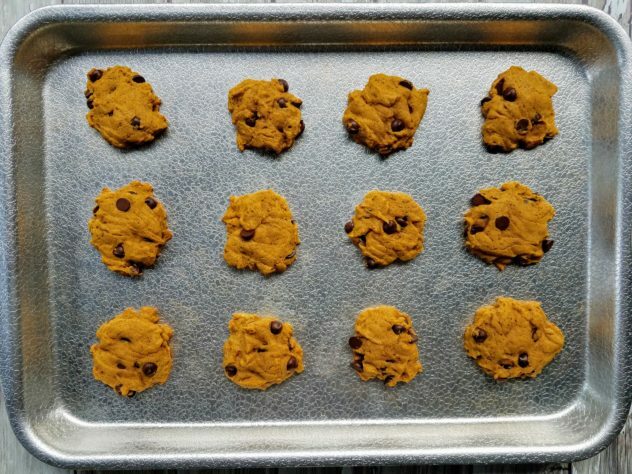 Are pumpkin chocolate chip cookies healthy? Depends on who you ask 😉 My personal opinion is that everything is healthy in moderation. 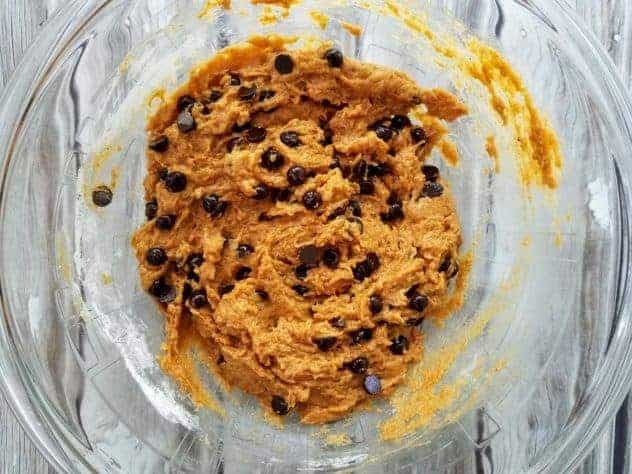 This version of pumpkin chocolate chip cookies is healthier than most, because I have replaced the butter with extra light olive oil, I have reduced the sugar, you know exactly what is in them, and I have made them dairy free (I used store-bought dairy free chocolate chips). It’s ok to indulge every now and then! 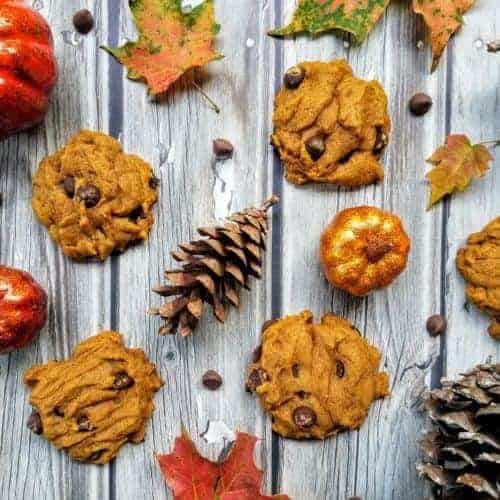 Can you freeze pumpkin chocolate chip cookies? 2. Add salt, baking soda, and homemade pumpkin pie spice. Mix well. 3. Add flour one cup at a time, mixing after each addition. After one cup of flour, your dough should look similar to the one on the left. After two cups, it should look similar to the dough on the right. 5. 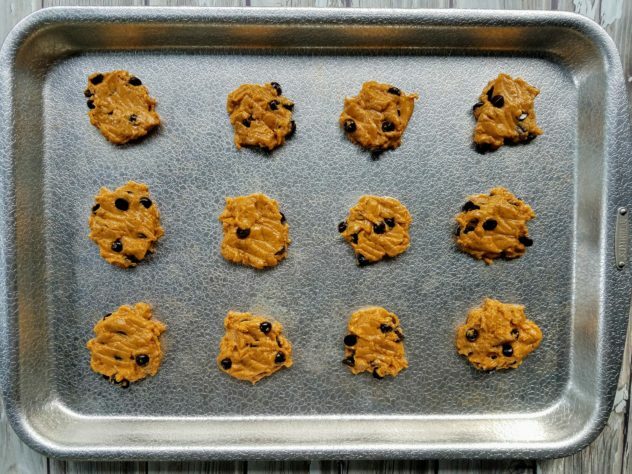 Using a small (or ~1 tablespoon) cookie scooper, drop onto an ungreased baking sheet. Flatten them out with the back of a spoon. 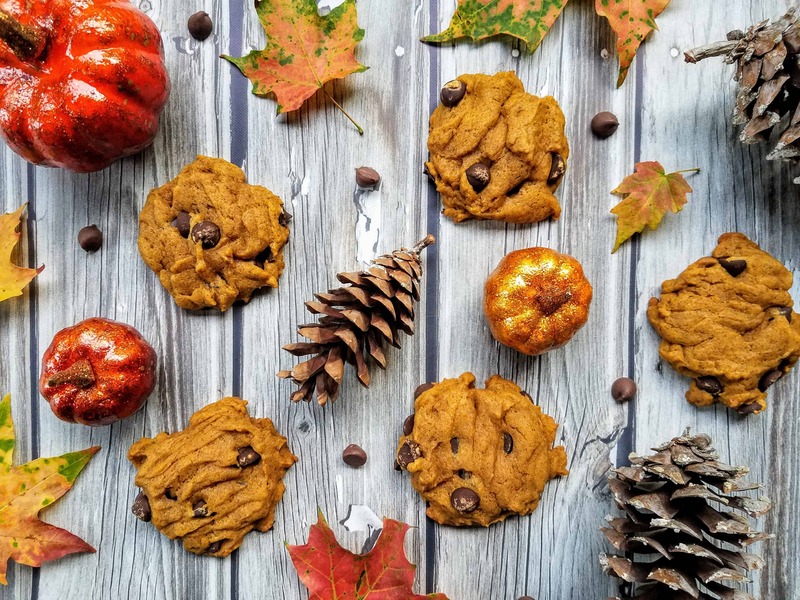 These cookies are the perfect way to start off the fall season! Serve with a glass of cold milk or hot chocolate. 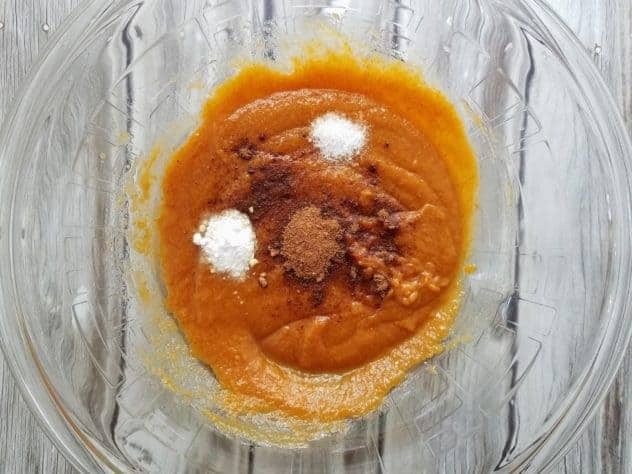 Cream together olive oil, granulated sugar, brown sugar, pumpkin, vanilla extract, and egg in a large bowl. Add salt, baking soda, and homemade pumpkin pie spice. Mix well. Add flour one cup at a time, mixing after each addition. Using a small (or ~1 tablespoon) cookie scooper, drop onto ungreased baking sheet. Flatten them out with the back of a spoon. I love such great yet simple to make recipes. Would try and give this a hand this weekend. Will let you know how it went! I love pumpkin flavored things and this recipe looks like the perfect way to kick off the fall season! This looks so simple to make (will totally be giving this a go) and seems perfect with a good cup of milk. Never had pumpkin cookies before. Hmmnnn…this doesn’t seem too hard to make for my baking challenged self. Might substitute with another flour type and add raisins. Something o practice on in the fall. It is that time of the year again when we get to enjoy delicious pumpkin treats like these cookies. I am saving the recipe for later. This is going to be great for those chilly fall afternoons. Yum! I am definitely going to make these over the weekend, I think they would be perfect for my sons school lunch box. Any chance to get some extra veg into their lives is helpful! 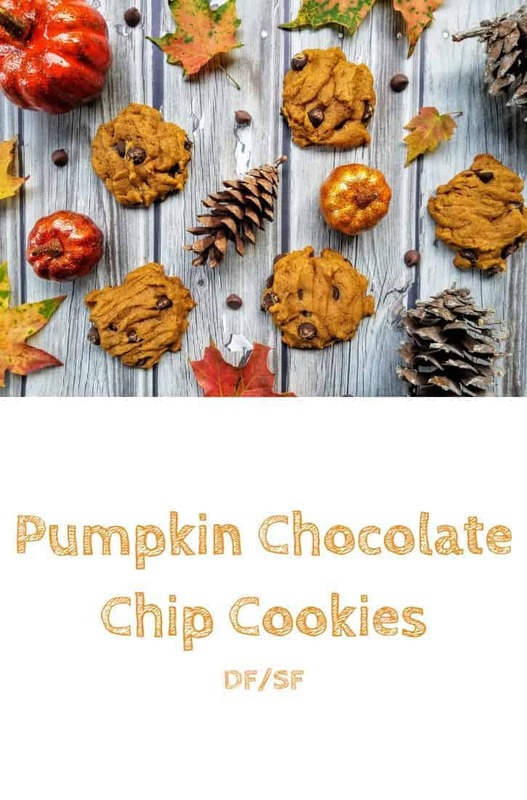 These look so delicious, I will save this recipe for when fall is here! Thanks for sharing! 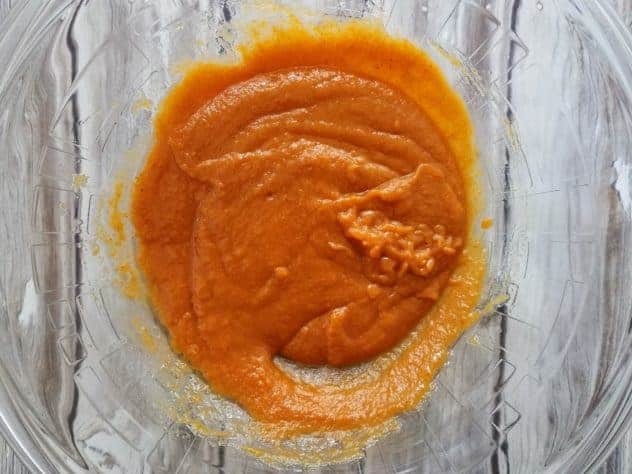 I am seeing a lot of pumpkin recipes and I am excited to do them at home. I will have to use our native squash though. 😀 I love the pumpkin flavor! Adding these to my baking list! Love how easy this recipe is to follow. And the cookies look delicious! Thank you!! 🙂 And yes, the cookies were delicious! I ended up having to put them in the freezer because I could not stop eating them 🙂 Let me know how you like them!